Thought I have ended with Switzerland's post, but just realized I missed to share with you this special flower and plants that I seen in Switzerland. 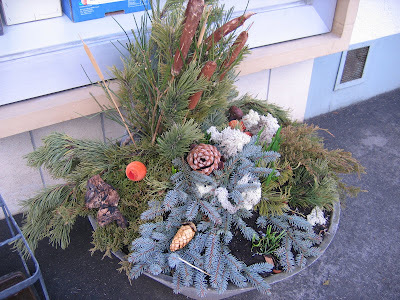 1) This is real plants and I guess it can be found only during winter. Those sell here is either plastic or dried plants. I like this kind of plants. Our final stop in Switzerland-Zurich, and just 1 day to walk around. -The Bahnhofstrasse is the main shopping street of Zurich, connecting the main station with the lake. On both sides and in side streets, you will find a lot of branded shops and boutiques. 5) Thanks to this friendly Swiss lady who helped us to call hotel in order to find out the exact hotel location, and she has a cute son. Finally I have done all the posts for my Switzerland trip, thanks for following me thru the whole series of this trip. If you have chance, you must visit this beautiful place. I fell in love with Luzern specially this Old Town.What a nice and beautiful places to discover walking of this medieval town!. When you walking by its streets you'll find lots of "awesome views of the city"
- so happy and excited to see snow in old town, also my first time see snow. - Two U students stopped by us and asked us few questions about how we feel about Luzern, it just for their project purposes. - not realized that there was a nice car captured in this photo, I personally like this photo very much. p/s next post I will show you the last stop in Zurich. 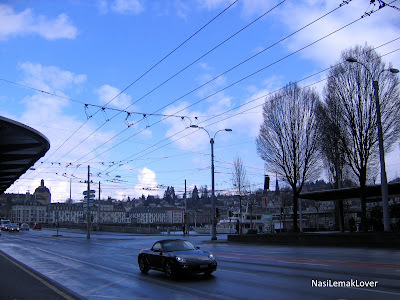 Here to show you where I stayed and what meals that I taken in Luzern, Switzerland. -This was the best hotel during my stayed in Switzerland. The hotel room is clean and comfort. - This hotel is certified to the ISO 9001 Quality Management System. - Glad to met a Malaysian Malay guy ( his name is Alvin) who work in this hotel and stayed in Luzern for about 12 years already. He is such a nice guy, he purposely came to breakfast area to see us and we have a short chat. - After severals days of pizza, pasta and cheese, we were missed Asian food so much especially rice, thus we went to a tiny and cosy Thai restaurant. - we ordered a mixed vegetables and beef cooked with soya sauce (free with two bowls of rice), both dishes were delicious and of course we finished it all. This two dish meal cost us CHF 45 ( ~ RM 145 !!!! *** sorry these poor quality photos was taken using mobile phone, as my digital camera was run out of battery. - This is must try Swiss Tradisional dish, cheese Fondue. 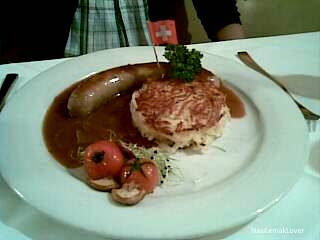 - I ordered another Swiss dish -Rosti (boiled-grated-fried potatoes ) and Sausage, and they are delicious! 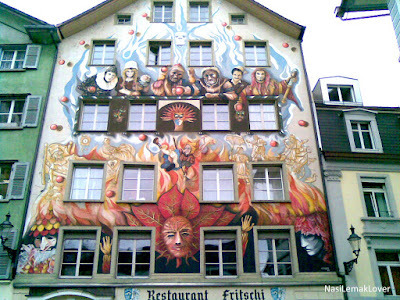 p/s Stay tuned for the nice buildings and what I saw in Old Town Luzern in next post. We took train from Luzern to Engelberg ( a small town down the Mt.Titlis). From Engelberg, we took bus, gondola, cable car and last Rotair(The Titlis Rotair - the world's first revolving cable car) to reach the summit of 10,000ft. Approx. total journey from Luzern train station to Mt.Titlis was about 2hours. So advised to go early in the morning and check weather condition before go.